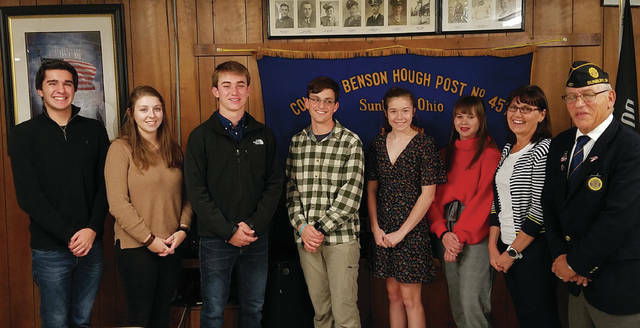 Each year Colonel Benson Hough American Legion Post 457 sponsors local high school juniors to attend Buckeye Boys/Girls State Programs. At these weeklong events the delegates form a mock government by holding elections for offices from local government to governor. The students must setup offices, make speeches, signs, and everything necessary to run for elections. They also perform the duties of their elected/appointed offices and learn how our government operates on a daily basis. During these separate programs delegates learn about patriotism and respect for the American Flag, Constitution, and the role Veterans have played in protecting our way of life. The 2018 Boys State program was held at Miami University, Oxford, Ohio, and Girls State was held at the University of Mount Union in Alliance, Ohio. This year Post 457, with the help of several fundraisers and generous donations from local donors sent nine students to these programs. Six of this year’s students attended a recent Post 457 meeting to report on their experiences and to thank the members for sponsoring them. Information for this story was provided by American Legion Post 457.